It’s that time of the year when the winter is slowly letting go, the air is becoming fresher, the weather milder, and the days longer. It’s spring! The perfect time to explore the great outdoors. 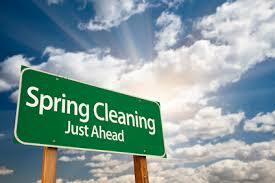 It’s also the perfect time to sweep, scrub and store away the winter woes. Do some thorough dusting. Clear off your table tops and dust them properly. You can go further and polish your wooden furniture by using a soft cloth and some vinegar. Ensure that you also wipe through the fabric of your couch by using the recommended detergents to redeem freshness and radiance. Deep clean your carpets. You’ll be surprised at how much dust, hair, and dirt builds up in your carpet. Use a high-performance vacuum cleaner to restore your carpet’s texture and color, it’s always best to hire a service, it may cost some cash but, you won’t regret it. Refresh your décor. Bring a new and refreshing life to your dining area and living room by mildly redesigning your interiors. You can do this by simply putting new photos in your frames and incorporating unique indoor lighting. Get rid of any expired foods. Check your refrigerator, cupboards, and freezers for foods that are past their due date and dispose them off properly. While you are at it, you can wipe down the fridge and its interiors as well as the shelves in the cupboards. Clean the racks, trays, grills, oven walls, and stove tops. Avoid using harsh chemicals that may scrap off the coatings on these items. A homemade detergent of baking soda and some water will do the trick for stubborn kitchen stains. Give your dishwasher a nice scrub. Do this by shaking some detergent onto a damp soft piece of cloth and wipe around the door seals to remove any food stains. Moreover, you can add some bleach to kill bacteria and leave your dishwasher fresh and sparkling. Now, wipe the countertops and mop the floor for a gleamy kitchen. Revamp your wardrobe. Chances are you don’t wear all of the outfits in your closet. So, separate them according to seasons and select the ones that you still want to use. For those that don’t fit or you just don’t like them anymore, you can donate them to charity or organize a swap shop with your friends and neighbors. For the clothes that you’ll keep, store the ones out of seasons in your wardrobe or attic. While you’re at it, you can do the laundry. Revitalize your bed. You may have that favorite set of duvet that you never get enough off. But over time, the colors may fade and you’re left with a dull-looking bed. Don’t worry! You can soak them up in baking soda and white vinegar and rinse them with a lot of water. This will help rejuvenate the colors and eliminate the lingering odor. Start by disinfecting the baths, toilets, basins, tiles, and showers with recommended bleaches and disinfectants. Also, polish the towel rails and toilet roller holder, and clean the sinks, mirrors, and taps. Rake the leaves and twigs in your yard. Start by collecting fallen sticks and twigs. Then, rake the leaves into heaps and dispose them off into large skip bags. Alternatively, you can turn the litter into much for your garden. Make your home charming and captivating with this simple spring cleaning guide. Enjoy your spring!